Four out of the 10 best-in-category branded Instagram videos from Jan. 12 through Jan. 18 didn't include sound. And while the social platform is inherently visual first and foremost, GoPro demonstrates that the right music and background noise can make 15-second clips even more enjoyable. The high-tech camera marketer strapped one of its devices on the back of a dog named Walter (who appears to be a labrador) and captured the canine's sprint to a nearby beach, where he jumped into the ocean. That's pretty fun to watch. Orchestral music, mixed with audible reactions from beachgoers, made the viewing experience better, as GoPro's video inspired 307,000 likes and comments on Instagram. The listening is almost as good as the watching, and the results show that applying a little tender-loving care to Instagram clips is probably worth the while. The four winning brands from last week that didn't utilize sound (Dior, Victoria's Secret, Urban Outfitters and the National Basketball Association) failed to perform as well as GoPro. The multimedia infographic below features eight categories (auto, beauty, consumer electronics, retail, fashion, celebrity, sports leagues and TV shows), which regularly appear in our Adweek/Shareablee top branded Instagram videos weekly chart. Two wildcard niches are always sprinkled in, and we've chosen magazines and fashion luxury for this week's edition. 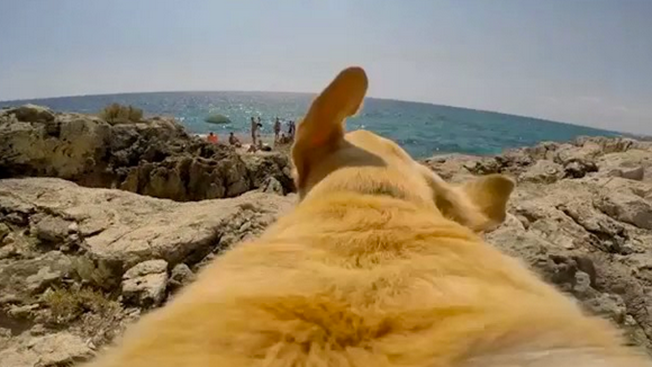 Check out GoPro's doggone-good work and the other winning Instagram clips while seeing what kind of reach the brands accomplished.